The beauty of a diamond comes from its Brilliance And Fire. This is the amount of light that is returned to the viewer’s eye after it passes through the stone. 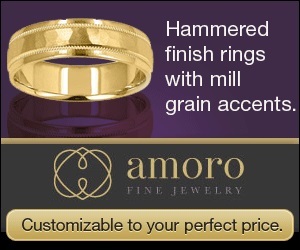 It is the skill of the cutter that unleashes light and brilliance from the rough stone into a finished diamond. 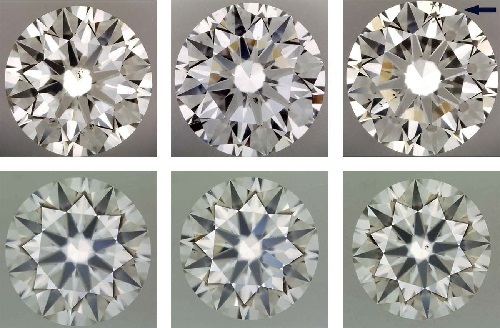 In a side by side comparison, a Less Expensive diamond of Excellent Cut grade will far outshine a diamond of higher Color and Clarity with a Poor, Good Or Fair Cut grade. Only 5% of all diamonds sold are Excellent or Ideal Cut, such as ours. Most diamonds sold at retail are Poor, Fair or Good Cut grades, and they appear milky and lifeless compared to a diamond of Excellent or Ideal Cut. You can calculate the return of light by studying the proportions of a diamond’s Cut. 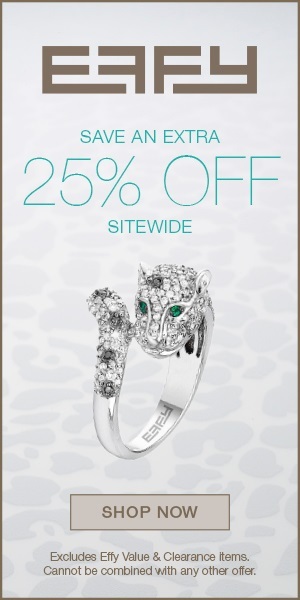 Most gemologists agree on the 60-60 Rule, that both the Depth and Table dimensions should be at or near 60%. In addition, the Pavilion Depth should be at or near 43.1% for the greatest return of light. . . . click here to read more about diamond Cut. What is an “Eye Clean” diamond? A diamond is considered “Eye Clean” if it has No Flaws Visible To The Naked Eye. First of all, you need to understand that gemologists grade diamonds for clarity using a 10-power loupe. 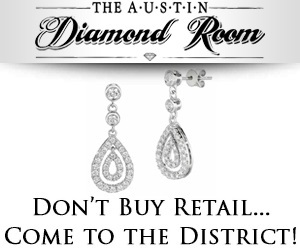 This is an important distinction if you are looking for the best value when buying a diamond. While the difference in Clarity between an SI3 diamond and an IF diamond cannot be discerned with the naked eye, The Difference In Cost Can Be Well Over 400% in a diamond of 1 carat or more. As mentioned above, the GIA Clarity scale rates and prices diamonds based on their Rarity and not their perceived brilliance and beauty. If you want the privilege of owning a rare masterpiece of nature, then we welcome you to consider diamonds above the SI Clarity range. In most cases, unless the viewer has a magnifying loupe, or a microscope available, they will not be able to see the difference. So, why should you pay more for a feature you cannot observer? Click here for more information about evaluating eyeclean clarity in diamonds. Why do we choose “Near Colorless” diamonds for our Best Value Collection? Diamonds are evaluated for color in the inverted position within a laboratory controlled lighting booth. After a diamond is set Face Up in a mounting, it is Nearly Impossible for for even an expert gemologist to judge the difference between an E-F Colorand a G-H Color in either daylight or indoor lighting conditions. In terms of best value, Colorless diamonds are very rare and expensive, while G, and H diamonds can save you a considerable sum of money, and the effect of these grades on the beauty and brilliance of your diamond is negligible. While the difference in perceived color is negligible, the difference in cost can be over 50% between a colorless diamond and a near colorless diamond of one carat or more. In short, near colorless (particularly G and H) diamonds represent a good value for a difference that is imperceptible. We avoid the grades of J, K and below because when they are mounted face up most viewers can see a slight yellow tinge. In a diamond of Poor or Good Cut Grade, it is easier to detect the differences in color, because the stone appears more opaque. When a diamond is Cut to Ideal or Excellent proportions, it produces a dazzling display of Brilliance, Fire and Scintillation that will far outweigh a minute difference in body color.